Nobody makes an Atlantic. Ugh. Is there a specific prototype you're looking to emulate? You might be able to make some hay with one of the Model Power/MRC 4-4-0s or 2-6-0s. Alternatively, PRR K4s were used for all SORTS of passenger work from limiteds on the Broad Way of Commerce to local passenger jobs or things between. I like the Bachmann 4-6-0 for a short passenger train, especially with a smaller tender. M.B. Klein still has a couple of road names and they are running a 10% off sale on Bachmann through the end of today, I believe. The 2-8-0 consol would be another good candidate. They did a little of everything. If he happens to model early Bavarian railroad, then he is in luck. Man, talk about pizza cutters... those things could slice up three pies at once! They just slice the "spikes" off. LOL, how did I forgot? I own 2 of them. I think though, that the original question was about an earlier (smaller) Atlantic (the Hiawatha Atlantic is a larger loco, designed to pull a long train of longer passenger cars). 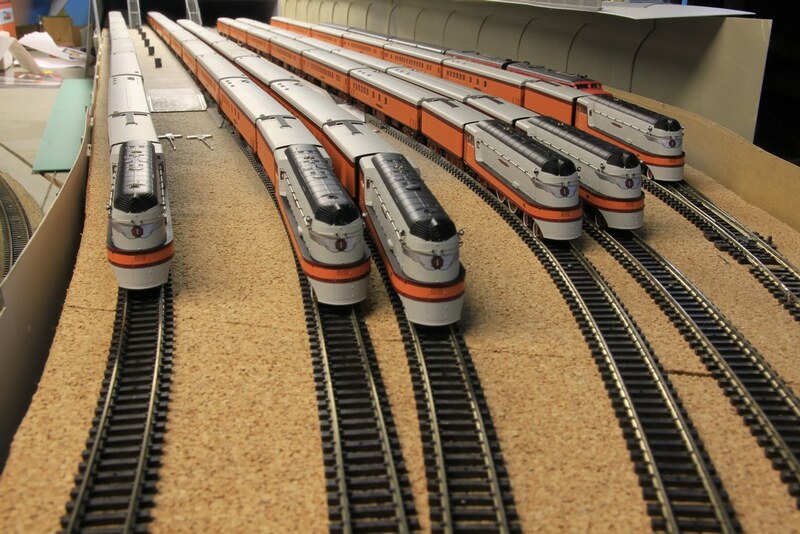 Model Power/MRC eight wheeler-The newest versions have sound and DCC. There are the old MPs before MRC bought the company that do not have sound or DCC. If you buy one of those, and, they can be had for low cost (relatively), you should also purchase a B-mann SPECTRUM USRA short or USRA standard tender or a Kato USRA standard, as those tenders are all wheels live. The old MP has only half wheels live stock tenders. The MRC/MPs have all wheels live tenders. The MRC/MPs also have traction tryres while the old MPs do not. Model Power/MRC USRA light Pacific-The current issues have only half wheels live tenders, so you would have to buy an all wheels live KATO or B-mann USRA Standard. Some of the current issues do have DCC and sound, some do not. Bachmann ten wheeler-This has factory DCC but no sound. It has sixty three inch drivers, which are small for a passenger ten-wheeler, but, there were several out there with drivers that small. For a local, speed is usually not a major concern, anyhow. MP/MRC Mogul-Same comments as the eight wheeler. More than one road had moguls equipped with steam lines and signalling devices for passenger work; SP and B&M probably had the most. KATO USRA heavy 2-8-2-An excellent steam locomotive and one of the yardsticks against which all N scale steam is measured. P&LE equipped some of their H-9s with steam lines and signalling devices for passenger work. Supposedly, this was to allow them to work crew shuttles, but, more than one of the H-9s pulled a commuter train when there were no Pacifics, ten wheelers or Hudsons available. There may have been other roads that so equipped their USRA heavy mikados (WP?). MP/MRC USRA light 2-8-2- Same comments as the USRA light Pacific. UP had a series of what were essentially copies of the USRA light 2-8-2 that it called "Mountain MacArthurs" which worked locals on the OSL and in Wyoming. They were a few feet longer than the USRA light, but, other than that, they looked just like one. There may have been other roads that equipped their USRA light mikados (or copies). Athearn/MDC Mogul- You could do some updates to reflect an old locomotive rebuilt repeatedly by altering some details (such as the mantle clock headlight fixture) and adding a few (such as a power reverse and a generator). B-mann 2-8-0-Early versions of this were try-before-you-buy, but B-mann has addressed most of those problems. It has fifty eight inch drivers, which is somewhat small for passenger work, but, you could get away with it. B-mann ALCo Mogul-It is a good locomotive. It has sixty inch drivers, which are small for passenger work, but you would get away with using it. I'm mostly into B&M and Amtrak. OK, how about a recommendation for a 4-4-2 that's available today? For an american prototype, there is only one out there, and like mentioned above it's a Hiawatha 4-4-2 by Fox Valley. Or you can try your hand at scratchbuilding and build your own.